Hello there! We hope you all had a blessed Vishu. It was kind of you to leave your good wishes and as always I enjoyed reading them all. 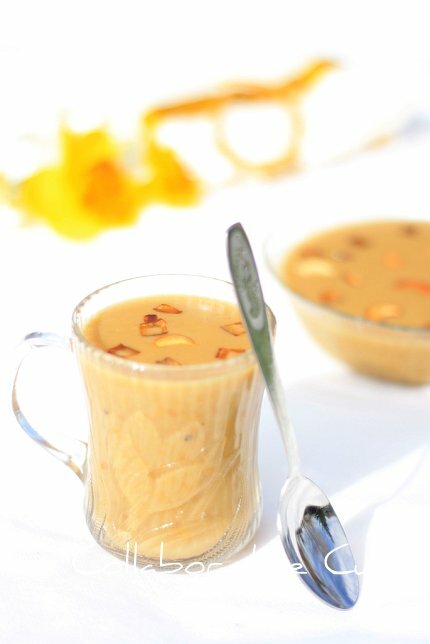 Today I am sharing the recipe for payasam (a dessert) which is served in Sadyas. I was confused and undecided about which payasam to make this Vishu. If I ask for suggestions to my husband and kids I will have as many different requests. You will agree in this scenario it's best to make something everyone enjoys, as well as memorable of some great Vishus celebrated with family back home (India). When it comes to payasam my father is the guru. He is a master at it and makes various kinds. Recently, for a family function all the men decided to get together and under his guidance make payasam, for a party of around 400. I mean, my dad is no Chef. His profession was with the education board and at this age to take up a challenge like this? I am sure my mom was anxious and fretted till the whole thing was over but from the reviews I have heard it was a success. When I talk about payasam and discuss recipe with my dad and sister they are all information about how to go about it. I am not as good as my dad but the recipe you can believe is coming from the right hands. Tried and tested a million times you will not be disappointed. Enjoy a sweet treat and wish you have a pleasant weekend. 1.Dry roast the moong daal till it turns slight golden brown and let it cool by spreading on a paper. 2.Wash and drain the rice and keep aside. 3.In a thick bottom pan cook the roasted daal after adding 3-4 cups water.Once it starts boiling, reduce the heat and allow to cook till it is half done. This took me about 11 minutes.The time varies depending on how much you have roasted it. 4.Now add the rice and boil again .Reduce the heat and let it cook completely. 5.The trick is to get both the daal and rice done at the end, without overcooking any. 6.This took me around 16-17 minutes.Stir carefully in between. If you think water is less add a little more and boil before reducing the heat. 7.The water should be a little bit on the higher side, compared to cooking rice for fried rice or for lunch. 8.Meanwhile keep the coconut milk ready.If you are using canned one, take 1 cup and add 2 cups of water in it and mix well. 9.In the remaining 1/4 cup coconut milk add the spice powders and mix well, so that there won't be any lumps. 10.Once the daal and rice is cooked add 2Tbsp of ghee and melted jaggery into it and stir well. 11.Once it starts boiling the mixture will start splattering, so be careful, and don't forget to reduce the heat while stirring continuously. 12.You have to continue stirring till it gets one thread consistency. 13.At this point slowly add the coconut milk water mixture and continue stirring. Now you could keep the heat at maximum. 14.One it boils well, say 3-4 minutes switch off the heat. 15.Add the coconut milk-spice mixture ad mix well. 16.Heat 1 Tbsp ghee in a frying pan and fry cashews, raisins and coconut slices, one by one, till they turn golden brown and garnish the payasam. If you are using fresh coconut milk, first you have to add the 3rd pressed milk followed by 2nd milk.Use the first pressed milk (without any water)for mixing the spice powders. Woooww...my fave is moong dal payasam..but we never added rice...what a variation? !.looks heavenly...Well, i have one question...its not regarding the recipe though...its about pics....do u use any extra lighting for the pics or is it just the sunlight?.....Ur pics are amazing!! Looks delicious and yummy.Its lovely to cook family tried and tested recipes. Good dessert after a spicy meal! WOW!! Kandittu kothiyakkunnu..and lovely pics as usual! Any payasam is OK with me and this looks great. Looks delicious and yummy...Ur pics are amazing!! Gorgeous presentation and pics..Like the use of ingredients..
awesome! use of ginger in kheer is new for me.. i know of alepakh as a ginger sweet. Thanks for sharing! Wonderful presentation. I like this payasam very much. Looks very tempting. WOW I really like this recipe, will try soon!! The payasam looks heavenly! I am craving for that cup of goodness now.Puddings, Payasam, kheer and halwa are my kinda desserts. What an elegant dessert with those cashews on top!! oh wow it looks so creamy rich and delicious, loved the color. My mother had made this once when she was short on moong dal, hehe survival act. Interesting payasam n it luks very gud. OmG! So So tempting payasam!Bakki undenkil parcel cheyyu! WOOOW !! 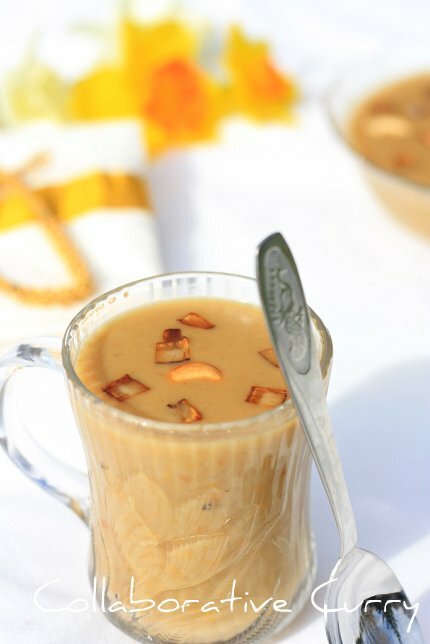 Yummy payasam dear..reminds me of my grandma's payasam...I am bookmarking this reciep to try soon. payasam luks very creamy and delicious...can i get a cup. Delicious payasam and a captivating payasam namitha. Adding rice n ginger powder is new to me,bet it would have tasted divine. Not sure what moongdaal is but the drink looks delicious. I will look it up. Wish I had some of the payasam for vishu, I made sheera..
U dad should have a great sense of cooking! Kudos for cooking payasam! The rice and dhal together in paysam should be excellent! Excellent pictures and lovely payasam.. I will be happy to get one glass of payasam right away. kidilam payasam... loved ur sadya series.. great effort! I've never had anything like this but would love to try it! Nice story about your dad the dessert...er payasam guru! Love the pic it looks so good! I would be interested in trying it. Lovely sweet treat. Looks yummy and inviting. this is a new payasam to me but looks so delicious. i just love all your clicks, Namitha, such a wonderful photo you have here of the kheer. Payasam Looks fabulous. Very nice clicks.. Delicious new combo of rice and moong dal in a payasam!! Gotta try this out.. It looks so good in that mug! Never knew about such healthy kheer. Great one. Hats off to your Dad! the Payasam looks delicious! this is awesome..what a click and such a yummy delicacy..your dad is great..something new to try for me now.. This dessert looks lovely! Your family is so lucky to have you create such delightful and healthy sweet endings. What a pictures.. Im drooling over the last one.. So yummilicious! This is something new to me. It really looks delicious! I like all the flavors in it - wish I could have a taste! You hit it best with some amazing recipes and some superb photos! Never tried of adding rice to moong dal. Lovely recipe and an equally lovely click to go with it. I've never had this before, but I can tell it is delicious just from the beautiful ingredients you used. Everyone must have been so pleased! looks delicious! and great clicks! I have never tasted anything like this. It sounds so exotic and delicious! 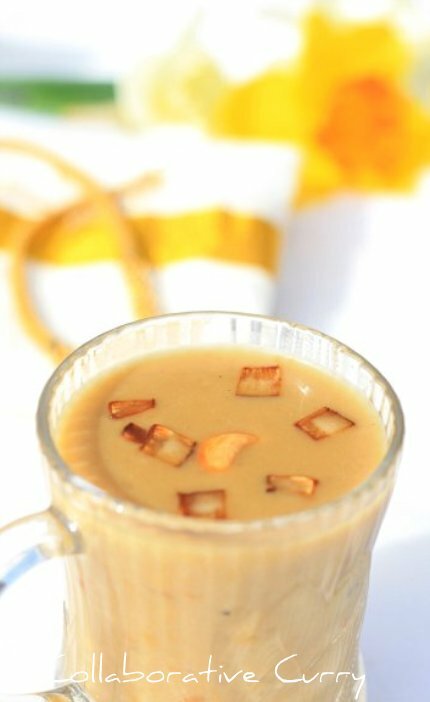 Drooling over ur pics...I luv any payasam...and this one is apt for my creaving right now...Lovely clicks! Looks scrumptious and what an elegant presentation! hey gulmohar..belated new year wish yar...wow...its really temtpting..i lov moong dal payasam bt nt with red rice...this really new to me....bookmarked!will try soon...ur click r superb too! Lovely payasam... very beautiful presentation. This sweet treat looks amazing. I can tell that you prepared it in honor of your dad, your traditions and love. Three wonderful things to have when preparing a dish.